It's absolutely true what is said about the snowball effect of home upgrades. A little paint here turns into new paint everywhere. Fix a broken tile here and soon whole floors need changing. Well, that's what has been happening in my "Just One Donna" home. Spring brought us a brand new kitchen and that kitchen makes everything else feel old and worn out. Not one to throw it all out with the bath water, so to speak, I have been working hard to find ways to update on a budget. Freshening up doesn't mean you have to break your budget. One room of focus has been the dining room which is adjacent to the kitchen. It's a work in progress, but I've made a few changes to get some momentum going. 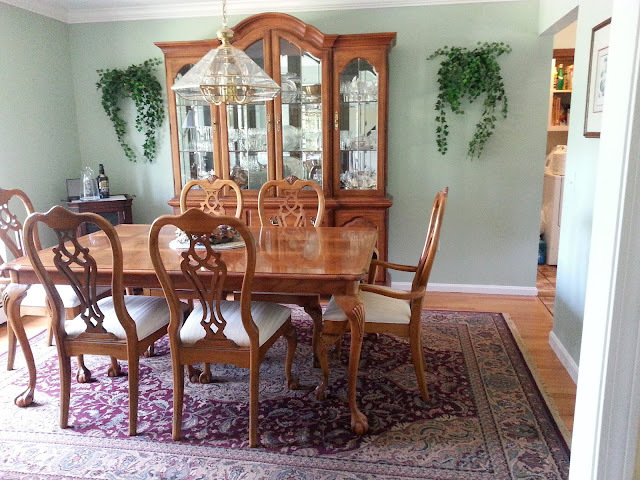 First, let's take a look at the before dining room. You can see it is a very traditional dining room. I love the traditional feel but wanted to add some more modern accents. Three things have changed. 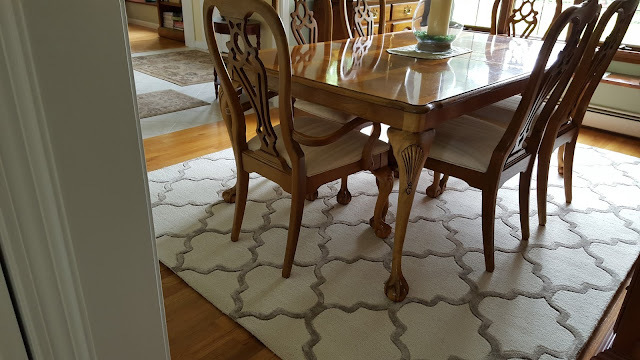 The first and most impactful change was replacing the rug. Then I decided it was time for the fake ivy, which had been on either side of the china cabinet, to take a hike. Lastly, I wanted a more modern chandelier for over the table. Here's the result of those changes. I'm very happy with the new look. I still have a few more touches to add. I want to replace three botanical fruit prints with one large art piece (one barely shows in the before picture), find a new lamp for my buffet and replace the mirror I have hanging above the buffet. I haven't found the right pieces yet, so I'll be patient until I do. Be sure to watch for sales. That's what I did. I love this makeover. 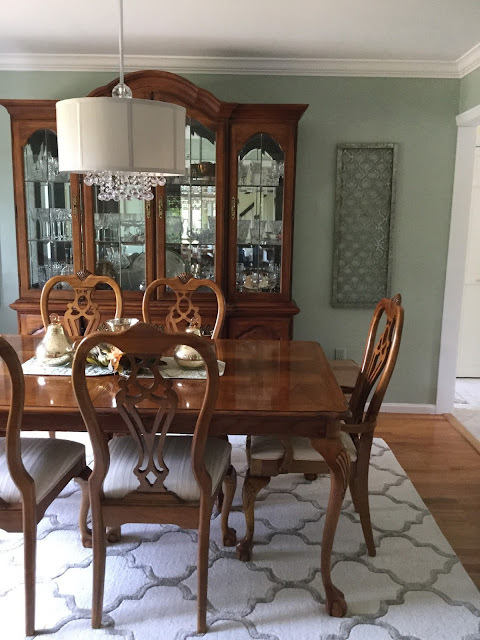 The rug makes the biggest impact, and that plus the chandelier really brighten up and modernize the room. Very clever!